Excellent choice when working with Multiwall Paper Bags. This machine is simular to the Doboy D-95 sewing machine. A Special designed single needle double thread chain stitch bag closing machine head with continuous motion feeding system for heat sealing. Equipped with pneumatic guillotine type crepe tape cutter.Automatic swing needle machine specially designed to operate as an integrated part of sealing system. Features continuous motion feeding; the timed needle moves in epicyclical rotations as the bag passes through the sewing head.Power driven feed rollers ensure accurate feeding of the bag and avoid damage to the sack, which can sometimes be caused by a feed dog. 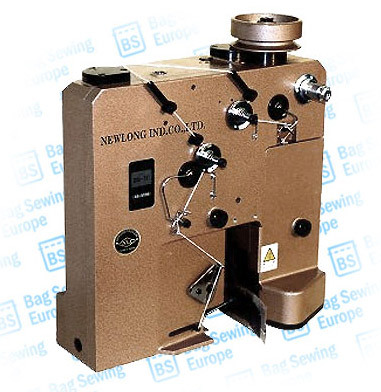 Model Newlong Industrial DS-7C is equipped with pneumatic guillotine type crepe-tape cutter. on sewing material and operation.